Michigan's Pictured Rocks National Lakeshore on Lake Superior stretches from Grand Marais in the east to Munising in the west. My family and I spent two nights in the beautiful town of Grand Marais and used the town as our home base to explore the area. Since we have two young children, my wife and I knew we would not be able to cover as much ground as we would've liked. We realized we wouldn't be able to hike or kayak, but our goal was to see the Pictured Rocks, the Grand Sable Dunes, and at least one waterfall. When we first arrived in Grand Marais, we spent some time in town and on the beach before venturing into the national lakeshore. We drove on Alger County Highway 58. H-58 is a meandering road that runs along the lakeshore. It leads to parking lots along the park's hiking trail, allowing people without the time or luxury to hike the whole lakeshore to stop and see its highlights. 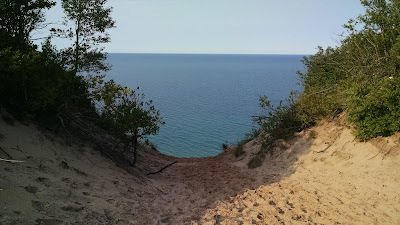 Since we were weary from a long drive from Metro Detroit, we only stopped at Sable Falls and the Log Slide Overlook on our first foray into the national lakeshore. We picked these spots because they are the two closest landmarks to Grand Marais, and they both have fairly short trails that we could handle with two tired girls. The falls were easily accessible for us, but reaching them requires descending a long set of steps built into the side of a steep hill. Our three-year-old could handle the steps, though we did carry her a little bit to speed things up. Sable Falls were peaceful and definitely worth the stop on our trip to Log Slide Overlook. The walk back up the steps was a little more difficult, and I did overhear an older couple resting on a bench talking about the difficulty of the ascent. After coaxing our daughters out of the woods, we continued up H-58 to Log Slide Overlook. 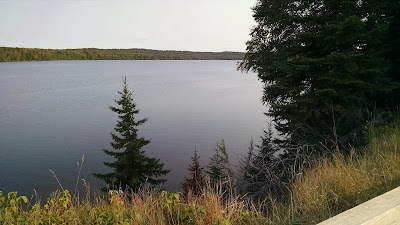 Before reaching the overlook, we drove by a beautiful lake along the road that we later learned was Grand Sable Lake. Except for one small dock along the shoreline, the serene lake appeared to be undeveloped. 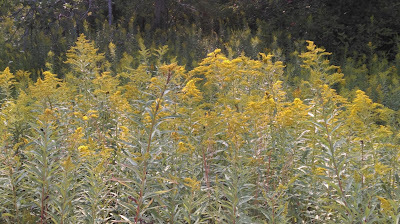 The trail near Log Slide Overlook was surrounded by these flowers. Log Slide Overlook's name stems from the locale's use as a log slide by Michigan's lumber industry. Lumberjacks built a wooden slide down the steep dune that they would slide lumber down to the beach below for easy loading onto Lake Superior's ships. This apparently is Log Slide and not a cliff that will lead to certain death. Now, the slide is gone, but brave visitors can walk down the steep dune to the beach below. It apparently takes only a minute or two to head down the slope, but an hour to return. We opted not to descend the hill with a two young girls in tow. 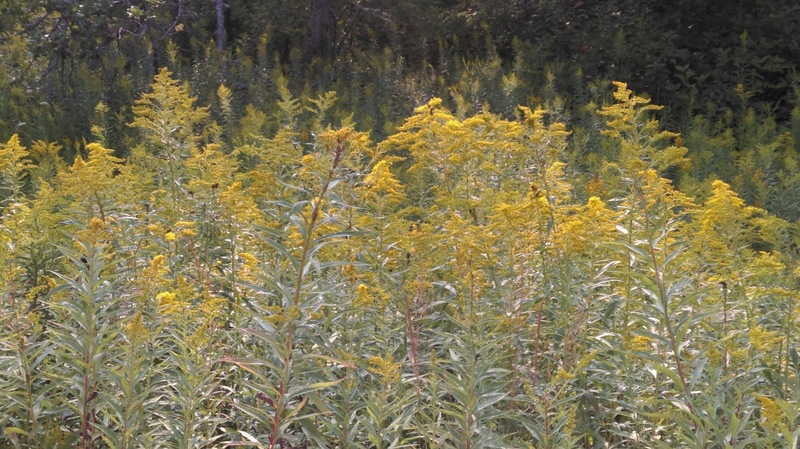 Instead, we walked through a short trail covered in brilliant yellow wildflowers to the overlook that provides a gorgeous view of Lake Superior, the giant dunes below, and the Au Sable Light Station to the northwest. With the steep drop to the water below, it felt is if I was standing at the end of the world. On our first morning in the area, we drove from Grand Marais to Munising to take a tour of the magnificent rocks with Pictured Rocks Cruises. With a population of 2,300 people, Munising seemed like a major metropolis compared to Grand Marais (population 350). 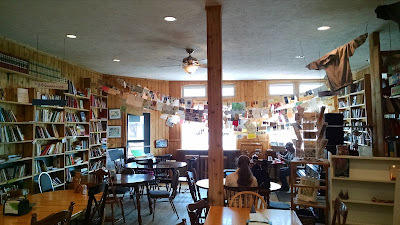 We stopped at Falling Rock Cafe and Bookstore for breakfast. They made great breakfast sandwiches, and the bookstore is a good source for Michigan-related gifts and books. 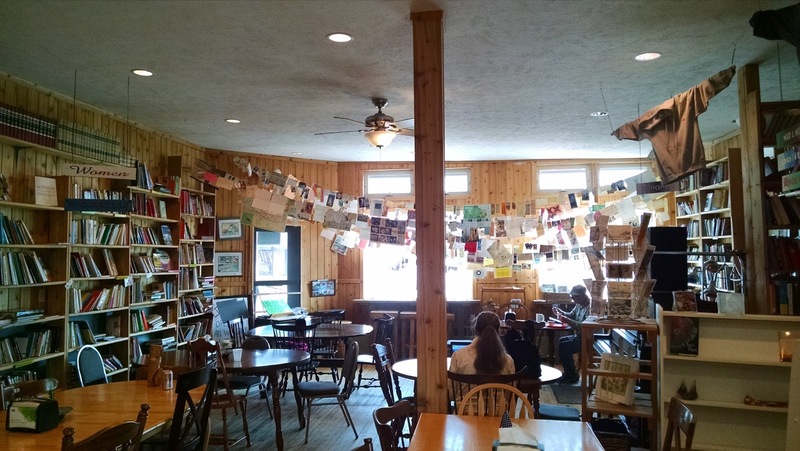 We picked up a novel about the Grand Marais area called South of Superior and Here, a book of poems and stories by women about the Upper Peninsula. 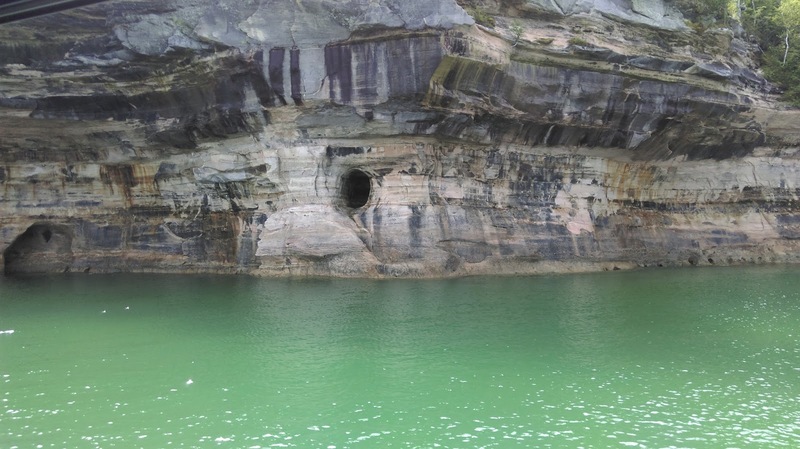 We did not have a lot of time to explore Munising because we had to board our boat, and the cruise takes about 2 hours and 40 minutes round trip. We did try Muldoons Pasties on the way out of town thanks to a tip from a Munising native who now lives in Detroit. I had the beef pasty, and it was the perfect meal. I could see why U.P. miners made these treats the cornerstone of their diet. My wife doesn't eat meat, but she loved her veggie pasty as well. The water was unbelievably green near the rocks. Though I would have liked to see more of Munising, we were there to see the Pictured Rocks. The cruise travels from Munising Bay to the Pictured Rocks. Our captain told us a lot of interesting stories about the area's history, and I was especially intrigued by the thought of visiting Grand Island. The island is a 13,500-acre national recreation area that also serves as a natural breakwater that protects Munising Bay from Lake Superior's storms. The Pictured Rocks are amazing. The cliffs rise from the emerald waters with multicolored stripes that reveal both their age and the minerals that have been deposited on the rocks over the years. They rise up to 200 feet above Lake Superior and stretch for 15 miles along the shore. As we rode along in our boat, we saw hikers standing near the edge of the cliff. I watched groups of kayakers paddle near the cliffs and longed to join them. A couple of small beaches occupy breaks in the rocks, and visitors looked content relaxing on the sand. Overall, the cruise was an excellent way to see the rocks quickly, and I recommend trying the cruise at least once. When we finished the cruise and our meal at Muldoons, we took a leisurely drive back to Grand Marais along H-58. We thought of stopping at another waterfall, but the girls wanted to go back to the Grand Marais beach. 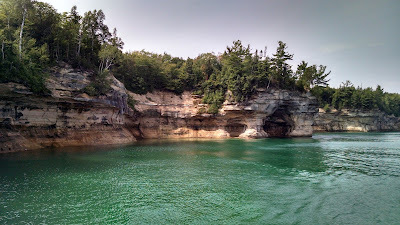 Plus, I knew I wanted to visit Pictured Rocks again. 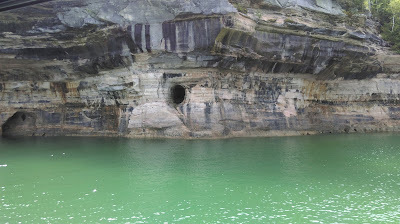 Actually, I need to visit Pictured Rocks again. I need to hike the trails and kayak under the towering cliffs. I need to able to move at my own pace and stop to enjoy the view of Lake Superior from a sandy beach or the top of a cliff. The rocks are calling me back.